Our range of products include flameproof rtd sensor, mineral insulated rtd sensors, resistance temperature detector, pt100 temperature sensor, conventional assembly - head type rtd and platinum rtd temperature sensors. RX RTD sensors are designed for measuring temperature in hazardous environments. They are made flameproof and explosion proof via a robust die cast aluminum head and mineral insulation. 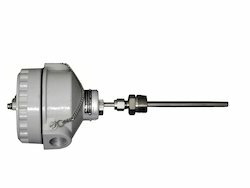 Optional heads include cast-iron, SS304 and SS316.The standard head for RX RTD sensors is certified flameproof for gas groups I, IIA and IIB. An assembly certified for gas group IIC (Hydrogren) can also be constructed. RX000 RTD sensors measure between -50 and 250 °C while RX500 RTD sensors measure between -50 and 400 °C. The RTD element is terminated in nickel-plated brass terminals mounted on a high-purity steatite terminal block. The block is mounted on a spring loaded stainless steel disc to protect the ceramic from impact and vibration damage as well as ensure proper contact inside the protective well. 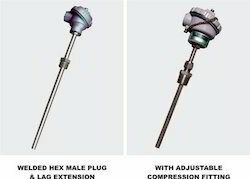 RX RTD sensors are constructed with single cable entry and single compression cable glands however, the options of dual cable entry and double compression cable glands are also available. Other options include connecting cables and thermowells. Mineral Insulated RTD sensor is designed to be light in weight and easy to install because of its integrated cable assembly. 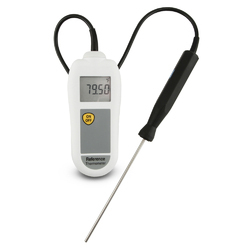 Capable of measuring temperature in the range -50 to 400°C. This model of RTD sensor come with SS316 sheath material or an optional SS316L. Platinum RTD in 2/3/4-wire configuration with single/dual elements in Class A/Class B /Higher accuracy as per IEC 752. MI RTDs can be bent as required. RC series of RTD’s are light in weight and are easy to connect or disconnect. They come with a sanitary tri clover connection and an integral 4 pin M12 connector. This RTD is capable of measuring temperatures in the range of -50 to 250°C. Connection cables with straight or angular M12 socket are optional. RC series RTDs are light in weight and are easy to connect or disconnect. This RTD comes with an integral 4 pin M12 connector.RC series RTDs are designed to measure temperatures in the range of -50 to 250°C. Connection cables with straight or angular M12 sockets are optional. Other calibrations and higher accuracies on request. RTD sensors with Protection Tubes are a cost effective alternate to thermowells in low pressure, low temperature applications. The sensor has a faster response compared to the more heavy-duty thermowells in non critical applications and adequate protection for the sensing element from corrosive medium. This sensor measures temperature between -50 and 400 °C. RTD sensors inside protection tubes have replaceable inner elements for easy maintenance. TThe TIG (Tungsten Inert Gas) welded process connection ensures a leak proof joint. Protection tubes are constructed of SS316 / SS316L to protect the RTD sensor from corrosive environments. Protection tubes are constructed of SS316 / SS316L to protect the RTD sensor from corrosive environments. Protection tubes are constructed of SS316L / SS316 to protect the RTD sensor from corrosive environments.The RTD element is terminated in nickel-plated brass terminals mounted on a high-purity steatite terminal block. The block is mounted on a spring loaded stainless steel disc to protect the ceramic from impact and vibration damage as well as ensure proper contact inside the protective tube. A weatherproof die-case aluminum head with threaded cap and chain protects the construction inside; other terminal heads may also be designed. 1/2” BSP (F) single cable entry with a single compression gland is standard with the option of dual cable entry and double compression glands. Its 2, 3 or 4-wire platinum RTD element can be constructed in single or dual assembly in Class A or Class B accuracy as per the IEC 751 standard for RTD sensors. Mineral Insulated RTD have flexible sheaths in lengths up to 50 meters for a variety of applications and installations. The SS316L sheath allows a wide range of applications in chemicals, food and pharmaceuticals. Furthermore, bendable sheaths are coiled to facilitate transport of the product. The measuring element in Mineral Insulated RTD can be designed in several configurations and conforms to the IEC 751 standard for RTD. It may be constructed of Pt50, Pt100, Pt200, Pt500 or Pt1000; with 2, 3 or 4 wire single or dual assembly; and in Class A or B per our customers’ requirements. The RTD element is terminated in nickel-plated brass terminals mounted on a high-purity steatite terminal block. The block is mounted on a spring loaded stainless steel disc to protect the ceramic from impact and vibration damage as well as ensure proper contact inside the protective well. A weatherproof die-case aluminum head with threaded cap and chain protects the construction inside; other terminal heads can also be designed. 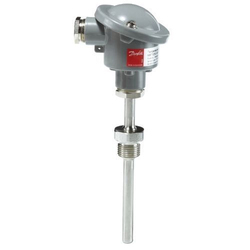 The standard temperature measurement range for this RTD is -50 to 400°C, however it may be designed for other temperature ranges. Compacted Magnesium Oxide (MgO) further protects the assembly from vibrations and increases its durability. Several options available with Mineral Insulated RTD are head-mounted transmitters, connecting cables and thermowells. Quick Disconnect RTD sensors are lightweight, with a quick response time and have a 3-pin miniature plug and socket for easy connection and disconnection. Two variants are available, RQ500 with a miniature plug and socket and RQ501 with just the socket. 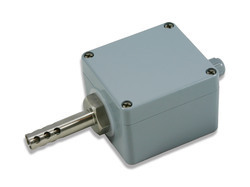 The RTD sensor helps to measure temperature between -50 and 450 °C. Its 3-wire Pt100 RTD element can be constructed in single or dual assembly in Class B / Class A as per the IEC 751 standard for RTD sensors. Quick Disconnect RTD sensors find many applications in laboratories. They are designed to measure a temperature range between -50 to 400°C. Mineral Insulation makes the RTD sensor flexible, vibration and impact resistant. RTDs (Resistance Temperature Detectors) - are temperature sensors that has a resistor inside that changes resistance value as its surrounding temperature changes. RTDs are being used for many years to measure temperature in industrial processes,labs and have developed a reputation for stability, repeatability and accuracy. Radix RTD elements mostly consist of a length of fine coiled wire wrapped around a ceramic or glass core. The element is mostly some what fragile, so it is often placed inside a sheathed probe for its own protection. The RTD element is made from a very pure material whose resistance at various temperatures has been known or documented. The material has this predictable change, in resistance which is proportional to the change in temperature; it is this predictable change that is used to determine temperature. Platinum RTD in 2/3/4-wire configuration with single/dual elements in Class B/Class A /Higher accuracy as per IEC 751. 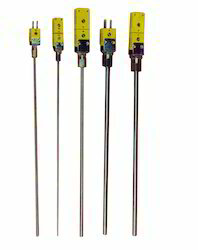 Radix Plastic Bayonet RTD Sensors are designed for temperature measurement in plastic process machinery and for quick connecting applications. 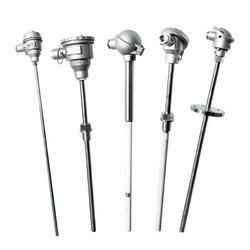 These RTD sensors may be constructed with fixed or adjustable sheath lengths as well as straight or 90° bent sheaths. The sensor is PTFE insulated with jacketed cables, we can also design them with SS over-braided cables. 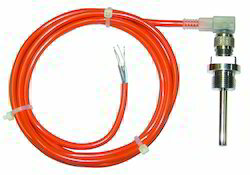 Each unit is supplied with one meter or multiples thereof of cable. The sensing element is spring-loaded in the bayonet cap of plated brass, with a SS304 cap also optionally available. Another option is a flex hose over the cable and threaded adaptors. 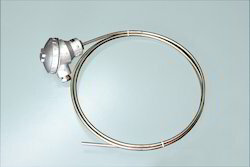 For Plastic Process Machinery and Quick Connecting Applications Fixed OR Adjustable length Straight OR 90° bend sheath -50 to 250 °C range, other range on request SS316 sheath PTFE insulated & jacket cables. SS over braided cables on request supplied with 1 meter cable or in multiples thereof Spring loaded bayonet cap in plated brass, SS304 also available Optional flex hose over the cable & threaded adaptors. sensor measures temperatures between -50 and 250°C. The teflon insulated cables are also rated up to 250°C. 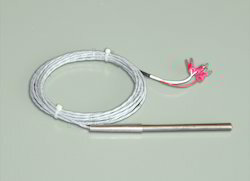 For additional thermal and mechanical protection, Radix offers an optional stainless steel braiding on the cable. Slot RTD sensors are designed to measure operating temperatures of electric motors, generators so as to detect and prevent overheating. The sensor with its slim dimensions can be directly inserted between the motor winding. The RTD is made of fibre body to withstand voltages up to 3KV, thus protecting its element from damage due to exposure to high voltages. 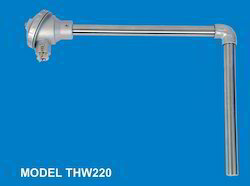 It is built in 50mm, 100mm or 150mm sheath lengths..The RTD sensors measures temperatures up to 180°C. Teflon insulated integral cable measure temperatures up to 250 °C. Its 3-wire Pt100 RTD element can be constructed in single or dual assembly in Class B as per the IEC 751 standard for RTD sensors. Dual elements can be constructed on request. GalvaTHERM is a specially developed metallic sheath to withstand the erosive nature of liquid Zinc. Recommended for continuous dipping. All assemblies are supplied with die cast aluminium terminal heads and high purity ceramic terminal blocks. Ungrounded (isolated) hot junction as standard. Assemblies may be dispatched with the hot arm unattached for assembly at the time of installation due to size limitations. 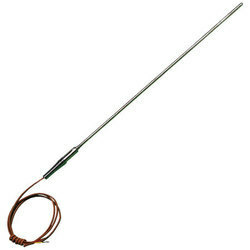 Dipstick RTD sensors are designed to measure oil temperature and find extensive application in the automobile industry. Its 3-wire Pt100 RTD element can be constructed in single or dual assembly in Class B / Class A as per the IEC 751 standard for RTD sensors. Its PTFE insulated cable ensures the RTD functions in wide range of temperatures and also gives chemical inertness in severe environments. 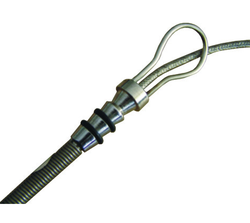 A flexible steel spring ensures easy insertion and ”O” rings prevent leakage of fluid while in use. Looking for RTD Sensors ?